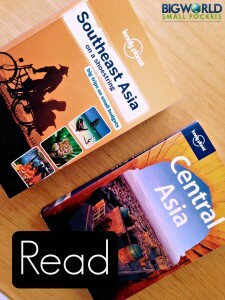 I’m not a fan of owning a lot of stuff, so the travel resources I list here really are the bare necessities you need. You won’t find expensive technological recommendations on the Pack list I’m afraid, just the simple things that I never leave home without. The sort of things I’ve forgotten once or twice and wish I hadn’t. I’ve also compiled a list of recommended websites that will help you book travel services that help you Move, Stay or Work your way round the globe. All the companies are ones that I’ve tried and tested, so are safe and reliable to use. After all, sometimes even the greatest vagabonds among us, have to occasionally make a plan and book something in advance! Finally, I’ve made some list of recommended destination guides, which it might be a good idea to Read before you go. Also in terms of planning, I’ve list recommended companies I always use to Insure myself when travelling. This might be an expense you’ll look to forego, but I strongly advise against it; peace of mind is a valuable asset!